Sometimes after years of looking at the same wallpaper and same décor items you want to see a change. A lot of people are eager to start redecorating their room, but quickly give up their project because they feel overwhelmed. Most people get overwhelmed with their project because they didn't do enough planning to flesh it out. Don't let yourself get overwhelmed with your décor project, remember to keep these tips in mind when you start to re-do your room. When you go into your decorating project you should start out with a generic outlook of how you want your room to look. You should know every major change you want to make in advance, but don't stress about small details like the vase you want to use or the designer rugs you want to put down. Some people know that they want to change the look of their room, but they don't know exactly how they want to change it. The best way to come up with a new look is to see what's already out there and get ideas from things other people have done. 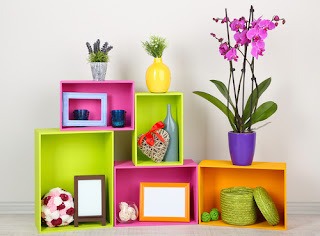 Check out home décor sites like Freshhome and Better Homes and Gardens, and go on Pinterest and Tumblr to search for tags like #DIYhome, #homedecor, and #roommakeover. It isn't uncommon to scrap a big home décor project because your plans are too expensive. A lot of people get ahead of themselves and outline the changes they want to make without checking to see if they can afford it first. If you take time to make a décor budget, you'll be able to develop a redecorating plan that you love and can afford. Some people get a little too carried away with their redecorating project and they end up filling their room with furniture and other décor items to go with their theme. You don't want your space to be too full of things since it'll make your room look smaller than it actually is.